I’m Caber. 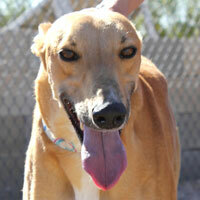 I’m a medium-size red male greyhound with a slender build. I am thoroughly enjoying my retirement from racing and the volunteers say that I’m a little ‘frisky.’ Any greyhound that is retired will understand the urge to be ‘frisky.’ We worked our fur off seven days a week, eat doggie fast food, and retired without a pension, not even a paw watch! Can you imagine? However, I hear there are great opportunities ahead. Some nice family will see me on the website or perhaps at tabling at a local pet store. They will recognize that I’m a prince among greyhounds and fall in love with me. Once they’re hooked, I can ask for toys, doggie beds, and the chance to snooze on the couch with the person who has the remote and watch Sunday night football. I’m game if you are!